With Winter just around the corner, there is no better time to have a custom Metal Roof expertly installed by Competitive Edge. Winter is a hard time on your roof, leaks can be very costly, and the last thing you want is your roof leaking in the middle of a snowstorm. animals are also looking for a place to stay through these cold months. This time of year, we’re often asked how a metal roof handles the #1 winter homeowner concern: ice and snow. Will snow pile up on my metal roof? 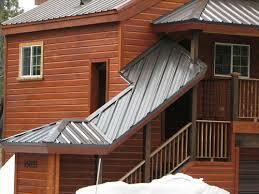 If you live in a snowy climate (much of the US and Canada), metal roofing continues to be the popular roofing choice. What can you do to prevent snow and ice from falling in big chunks off the metal roof? Metal roofing systems are not only designed to shed snow and ice, you can also have snow guards or heating cables installed along with it. These help to break up big snow or ice chunks and avoid the “avalanche” effect on walkways and other traffic areas outside your home during the winter. Will a metal roof make my house cold? With home heating costs doubling in the last two years, you may be surprised to learn that metal roofs are excellent insulators. Not only will a metal roof keep your house comfortable, regardless of the weather outside, it can actually help lower your wintertime heating bills. Contact us for your free estimate and we guarantee the cheapest price in the business!